The award winning Hankinson Painting Group has strengthened its commitment to training with the unveiling of its new Training Academy in Bromborough, Wirral. Aug. 18, 2010 - PRLog -- The award winning Hankinson Painting Group has strengthened its commitment to training with the unveiling of its new Training Academy in Bromborough, Wirral. 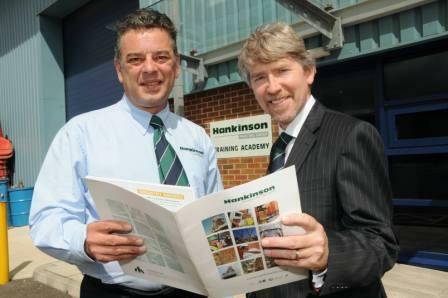 Already recognised as industry leading, Hankinson Painting Group Chief Executive Stephen Hankinson commented “the new Training Academy will provide the perfect facility to train staff in the competency levels required by our clients”. With National Industry award wins for work as diverse as industrial painting on Runcorn’s Silver Jubilee Bridge and Menai Bridge in North Wales, through to decorative work on St. George’s Hall and the Trafford Centre, the Group is fast gaining a reputation for providing the highest standards of performance in delivering projects. Hankinson Painting Group became the first contractor in the UK to achieve the National Highway Sector Scheme 19A (NHSS 19A) for corrosion protection inclusive of the Industrial Coating Application training scheme (ICATS) for all painters. Stephen Hankinson commented “I have always recognised that our staff must be given the necessary skills to drive the business forward. The learning Hankinson Painting Group provides for its’ operatives has always been industry leading and the new Training Academy will provide the perfect base for us to build on these strong foundations. It will provide us with the facilities to ensure all our staff are the best in the market place. In particular we are really building on our industrial and highways expertise to be able to provide the same high level service to the Rail Sector. Our investment in training coupled with our experience and expertise in Highways has enabled us to branch out into rail. Following the appointment of Carl Nolan and with his experience and expertise leading the Rail Division, we are best placed to deliver on all aspects of managing, planning and the financial control of small, medium and large rail projects”.